How to Choose Cool Tongue Rings? Finding cool tongue rings are the latest trend in fashion today. The more it gets in popularity fashion industry. Among stylish individuals because it helps them to get a trendy look. Almost all people highly prefer cute tongue rings that are available in numerous styles, designs, and sizes, so you can carefully choose the right one online based on your individual taste and preference. Cool tongue rings along have accessories that are specially craft and exquisite jewelry item that brings people a stylish appearance. There are different varieties of touch piercing jewelries available, yet tongue piercing rings gain more recognition among piercing lovers because of its exceptional design and surprising piercing benefits. Tongue rings come from quality materials which allow people to get hassle-free piercing results. If you want to buy the best and attractive tongue piercing jewelry, you can visit the best online store where you can see a huge collection of high quality and hassle-free tongue piercing accessories. There are many major tongue piercing jewelries available that include steel tongue piercing, UV tongue piercing, titanium tongue piercing, steel and UV tongue piercing, anodized tongue piercing and tongue silver piercing. The fine collection not only narrows down your searches but also helps you to find out your favorite design easily. 1 How to Choose Cool Tongue Rings? Every person wants to improve their personality and look, so they are trying different types of beauty techniques and products. Wearing a perfect piercing jewelry helps you to get the desired look easily and quickly. If you like to get a tongue piercing, you can choose the right type of tongue piercing jewelry online. The internet store is a precise platform which comes with a great selection of the best tongue piercing rings. Tongue Rings are the specialized piercing accessories which will help you to transform your facial look in an excellent manner. Are you seeking for the most attractive and excellent tongue piercing jewelry? 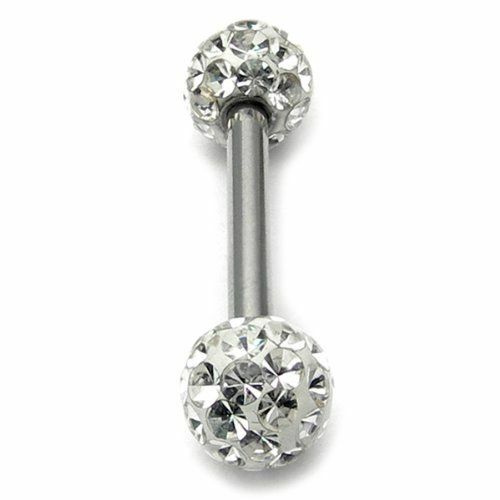 Therefore multi stone ball tongue barbell is a right choice for your piercing requirements. There are many attractive stones available in this barbell which brings your tongue a dazzling look. This tongue barbell is made from 316L surgical steel in order to bring you safe piercing results. The price of this multi stone and quality tongue barbell is affordable, so you can buy it without any hesitation. The internet store is an ideal destination for people who want to save money on jewelry shopping. There are several types of tongue barbells available in this present market, but few of them gain more recognition among people due to its unique look. 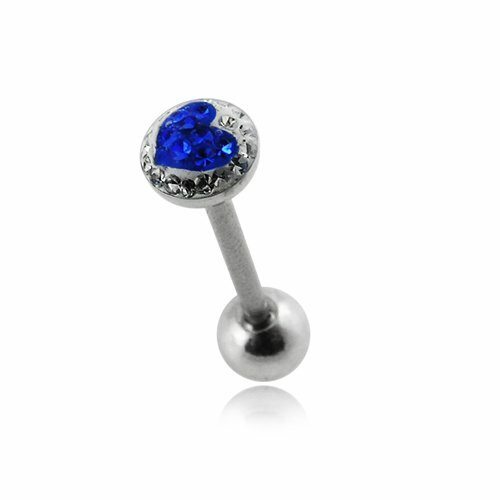 This tongue barbell comes with a multi-stone ball in order to provide your face a spectacular look. These specialized tongue rings are made from 316L surgical steel for safety purposes. It is a safe material which allows you to enjoy your cool tongue rings without any unwanted hassles. The design and style of this tongue barbell are really exceptional that perfectly suits your individual personality. Want to wear a special type of tongue piercing jewelry? You can buy and use this assorted color barbells. These are the most colorful and wonderful jewelry items that come with Candy Stripes and UV Balls Ring. This type of body jewelry has some special and exceptional features in order to bring more enthusiasm to your individual personality. 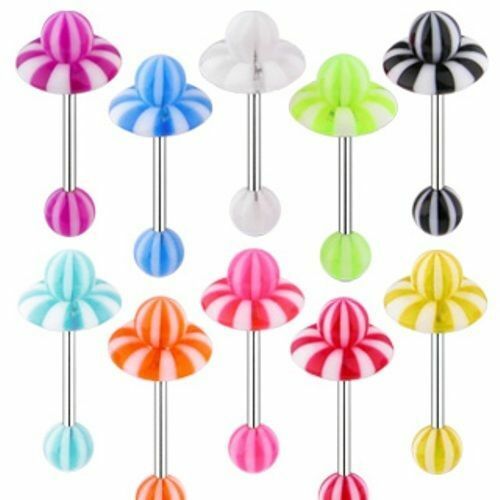 These cool tongue rings are available in different color combinations, so you can choose the right one as per your individual taste and piercing requirement. Body piercing helps people to improve and enhance their personality and create a unique fashion statement. For this reason, many stylish citizens do not want to buy and wear the most designer and sophisticated piercing jewelries. Consequently, the demand for stylish and exclusive piercing jewelry is increasing more and more. 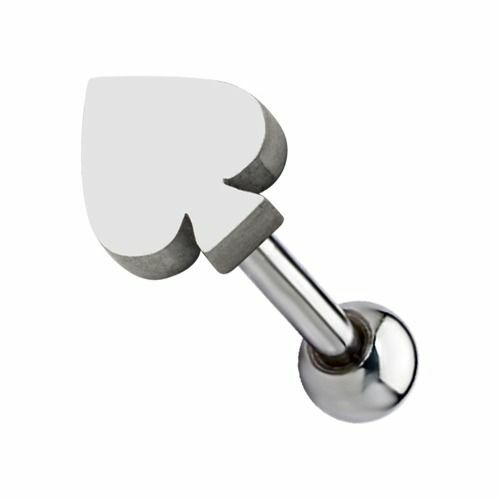 In order to meet the demands, the online stores come with a new collection of uniquely crafted Tongue Rings, known as Tongue Barbell with 4 Free Numeric Logo Ball. This is an excellent accessory is made from 316L surgical grade steel. The straight bar of this barbell comes with a logo ball to provide you a lovely look. 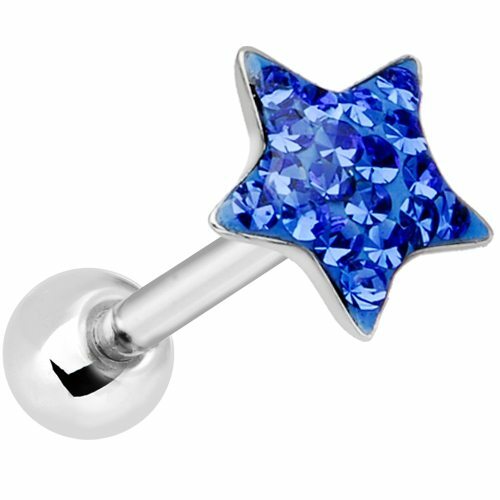 The touch piercing jewelry is available in numerous designs and shapes, so you can choose the right one like Tongue Barbell with Epoxy Crystal Stone Star Top. This is an amazing and excellent tongue barbell which is made from high quality and more durable 316L Surgical Steel. There are lots of colorful stones embellished in this barbell which provide your tongue an attractive appearance. This SS Tongue Barbell With Heart Crystal Top is an attractive and stylish tongue barbell are also designed by using top quality 316L Surgical Steel. Along with this, it is also embellished with a pure heart-shaped and attractive dangling end. While speaking about the crystals, these are covered by using the Epoxy coating in order to prevent the crystals from falling out. Body piercing jewelry embellishes with colorful and attractive stones in order to bring you added chic and also a stylish statement. 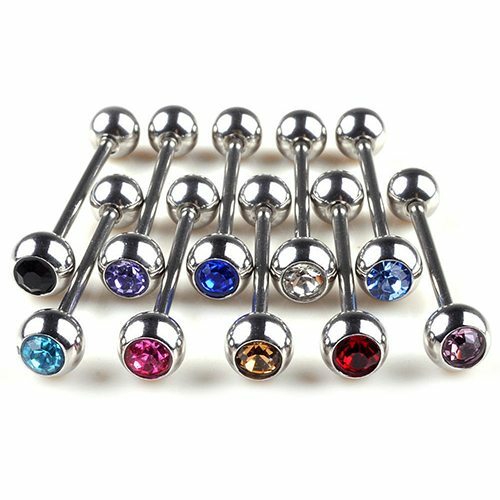 If you are seeking for the unique tongue rings, this tongue barbell with single pink stone is an ideal choice for your requirements. This wonderful tongue barbell is covered by attractive crystals. If you want to look stylish, you can buy and wear this Engraved Heart Plain Tongue Ring. This is a uniquely crafted tongue ring which brings your touch more exceptional and wonderful look. Furthermore, Tongue Jewelry Rings are also available in standard size. The price of this engraved heart plain tongue ring is reasonable, so you can buy it without any hesitation. As a result, these are the most popular and highly attractive tongue piercing rings that perfectly suits all tastes and personalities.